Our thanks to Melissa (who has been a guest at the Inn on more than a few great stargazing evenings) for reminding us to get out the binoculars late Monday night/early Tuesday morning. That’s when Comet Lulin will be closest to Earth, at a distance of 38 million miles. Comet Lulin, discovered by a Chinese teenager at the Lulin Observatory in Taiwan, is unique for a couple of reasons. First, it is essentially traveling backwards through the solar system. Most of the objects in the night sky, including planets and other comets, travel clockwise around the sun. Not the case with Comet Lulin, which is traveling counterclockwise.The second reason that Comet Lulin will be interesting to see is that it can appear green due to chemicals in the comet. 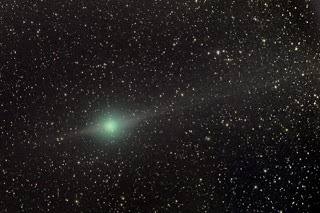 The comet will appear to observers without telescopes as just a fuzzy ball in the sky. It also appears to have formed and lost its tail at least twice due to solar wind gusts. That won’t stop us from checking it out, since we’re located in a rural area that sees nice dark skies at night and no city lights, making for good viewing conditions.